Planechase Anthology releases on Friday, November 25, and includes all the components needed to play a Planechase game. Planechase is a casual variant of Magic that utilizes a separate deck of oversized cards called Planes. These Planes cards affect and influence play in powerful ways. The best part: Planechase can be played with any format—although its most popular implementation has been paired with Commander. Consider using Planechase Anthology at your Commander night to add an extra layer of fun and variety. Planechase Anthology contains a complete collection of all 86 Planes cards—including the promotional cards—and an oversized planar die, essential to the variant. Additionally, Planechase Anthology provides a stand-alone multiplayer Planechase experience right out of the box with four ready-to-play, sixty-card decks. No deck construction required. They get to jump right in and experience the fun and chaos that is Planechase. Who Will Be Most Interested? Planechase adds a depth of complexity and strategy that is likely to appeal to your competitive players but it's also amusing and light in nature, appealing to your less competitive players. 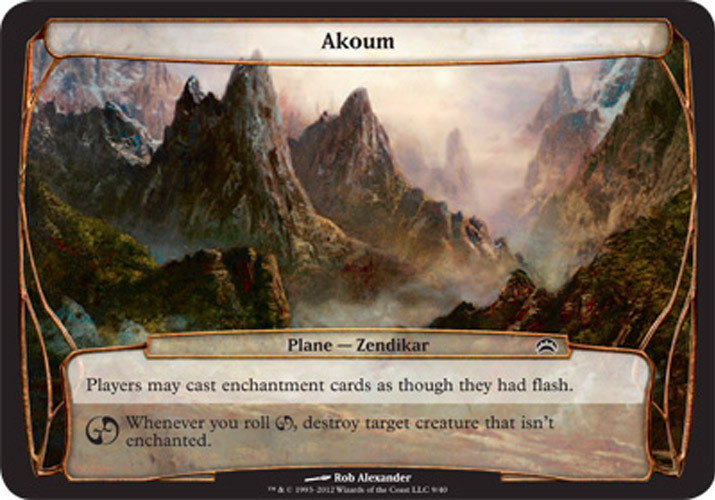 Each Plane card speaks to the flavor of Magic's deep lore, which might resonant well with your players who enjoy Magic's rich story. Prepare your players for the enjoyable chaos that is Planechase with the release of Planechase Anthology on November 25!